The Largest Choice of Carpets and Flooring at the Lowest Prices in our factory showroom, junction 38 off the M1 - GUARANTEED! Shaw Carpets of Barnsley are the largest and longest established carpet factory outlet in Yorkshire. At our 250,000 square foot site we have Carpets, Cushion Floor, Luxury Vinyl Tiles and Wood in all colours, quality and price. We are conveniently located just 1.9 miles off the M1, Junction 38 and open 7 days a week direct to the public. We have been supplying and fitting carpets to homes and businesses in Barnsley, Leeds, Sheffield, Harrogate, Wakefield, Huddersfield, Bradford, in fact the whole of Yorkshire. We are the largest stockist of budget carpets and luxury 100% Wool Berbers, Wiltons & Twists, all at genuine unbeatable factory prices! 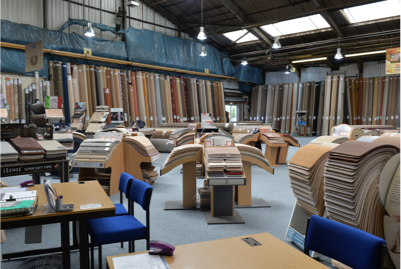 We have the largest selection of carpets and flooring under one roof anywhere in Yorkshire! Still a family run business. We are flexible and understand that customers are individuals, and qualities, budgets and needs vary. Customer satisfaction is our number one priority. Check out Google Reviews. 24 Hour fitting service available by our team of expert fitters. Free storage of your carpet until required. Low Price Promise – We GUARANTEE to be able to beat any other quotation. "Excellent service from start to finish. Vast showroom with lots of choice. I was quite specific about the carpet I wanted and was given helpful advice. I needed the carpet to be fitted quickly, after the decorating work was completed and Shaw Carpets were able to accommodate, which was fantastic. The fitters were very efficient and did an excellent job of fitting out my study and stairs/landing, all of which looks absolutely amazing! I'm pleased with the carpet I chose and I'm absolutely delighted with the finished result. It was worth the drive to Barnsley from North Leeds and you deserve the 5 stars! Thanks so much!" "Just a note to thank you for the excellent service we have received from your company. The Salesman on Saturday was very helpful and helped us make a good decision in which carpet to have. Your fitters today were very efficient and friendly. This is the first time we have used your company and will not hesitate to do so again. Thank you very much." "Hello, I just wanted to say thank you for the quality and service I received from your company. It was a pleasure to deal with you all, right from dealing with Ian when we visited your shop, the nice gentleman who came out to measure. The fitters Carl and Jamie who did a fantastic job, please pass on my thanks again to them. It is such a pleasure to be able to send an email to say thank you. I would definitely recommend your company to anyone and would not hesitate to order again." "My experience with Shaw Carpets was definitely 5 stars! A visit from Darren from Shaws who arrived promptly at my home with a van full of samples, keen and ready to measure up. His expert advice gave me all the information I needed to make that all important decision. He quoted a very competitive price and we set the date. The carpets were fitted and WOW they look absolutely amazing and I am so thrilled with the result. I would definitely recommend Shaw Carpets to all my family and friends. First Class Service!" "Had a new bedroom carpet fitted recently after having had my front room carpet fitted a few years ago. Can't recommend Shaw Carpets highly enough. Staff are incredibly helpful, great prices, excellent selection and fitted quickly and efficiently. Thank you!" "First rate service and ace prices. Existing customer and will use again." "Fantastic deals, friendly knowledgeable helpful staff. Great fitters. Will never consider anyone else in the future after this fantastic service." "Fantastic customer service and quality. Used Shaw Carpets for years and they still deliver. Got great advice in the shop and the carpets are gorgeous. Friendly and efficient fitters too. Thank you **"
"This is the second time we have used Shaw's carpets, the customer service is great, there is always someone on hand should you need advice but leave you to look around their vast range of carpets in your own time. They saved our carpet till we were ready for it fitting & the fitters were very good also, thank you David & the rest of the team." "This is our third carpet from Shaws. Customer service, quality and price are all excellent. We particularly like their 80/20 wool carpet which is kept in stock and is a bargain price for the quality. It feels very luxurious. The two carpet fitters were professional and made a really good job including trimming down some doors so that they opened smoothly over the carpet. Thanks very much Shaws-we'll be back.